Should referees be relegated too? It's a brilliant idea - a league table for referees, with promotion and relegation at the end of each season so that the English Premier League gets the best-performing officials. After reading about the proposition by Stoke City manager Tony Pulis, I was surprised to learn that there is no pecking order in terms of who gets what game, as it seems like I see Howard Webb on my television almost every time one of the big-four clubs takes the field. However, according to the Professional Game Match Officials board, which looks after the referees, there is no such thing as a hierarchy among top-fight officials. Instead, a list of names for all matches is drawn from a select group that is sent out every Monday. So, technically, the likes of Chelsea and Manchester United do not get the best of the best every week. 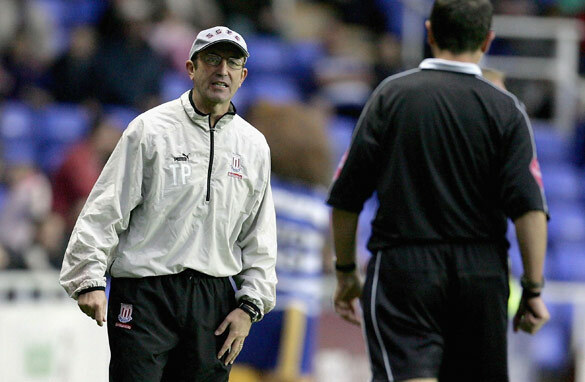 At present, clubs and managers do get the opportunity to assess officials after every game, but Pulis wants to take it a step further by giving the clubs the chance to vote on officials at the end each season, with the lowest-ranked officials demoted to the Championship (the English second division) - from which the top refs would become their replacements. Personally, I think that’s as it should be. Too often in football, referees make mistakes that come at a huge cost to the clubs, whether in terms of points lost or players lost to suspension, and though they are sometimes taken off the top list for a short period for such transgressions, there is not a system transparent enough to deal with the situation. Yes, they may be pilloried in the press or hammered by the fans, and they presumably get some kind of internal review, but over the following weeks, months and years, there they are still officiating the big games, and clubs currently have no influence in their selection. Therefore, a league table should placate those people who believe that referees - unwittingly or otherwise - have their biases, and are influenced by the status of the teams they’re officiating and the clout of the big-name managers. Often it may not be intentional, but getting dazzled by star power is only human nature, and any system that makes an official question the motives for his judgment is surely only a failsafe that will make him do his job better. So good on you Tony Pulis for turning a negative (Stoke being denied a penalty against Sunderland at the weekend) into a positive, with a valid suggestion that could be adopted throughout the game, never mind just in the Premier League. Players, managers, fans and even directors are required to be accountable, so why not the refs? Yes i strongly agree that referees should be relegated because of some poor judgements some times which causes teams alot.just look at the game between Spurs and Man utd that was not a good dicision from the ref.Secondly during the World cup we all saw the game England against Germany the disallowed goal that cost England alot.i thing with this dicision referees should be relegated. In many of our educational institutions like universities, colleges and centres of excellence, students are requested to evaluate the lecturers, readers and professors at the end of their courses. Such evaluation does help to assess the quality, relevance and performance of the deliverer of goods. Referees have an important role to play and an evaluation of their performance would be a step forward. Great idea! I totally agree with everything that has being said about the subject. Talking about subjectivity, can anyone guarantee that club officials will not be subjective when they vote for their 'best' and 'worst' referees? I think a ranking system is a good idea but it should be based on the referees' track record, such as how many blunders each one has in their record, not based on what the clubs prefer. I personally 'referee relegation' doesn't really help anything. The refs should get minus points for their blunders and pluses for their brilliant jobs. Those who get numerous minuses can only referee a limited number of games. Why should only the famed and wealthy clubs get the best? Just because they bring in more money??? Referee is aiways the last man when it comes to making decesions on pitch durind play. Yes mistakes are madeand referees should always be questioned,i think.But,still doesnt change a thing they make the decesions on pitch during play,right or wrong,they are the last men.